Pheasant Pelt Retrieving Dummy. $19.95. Great for drags!! Gotta order more on payday!! Quality product. Lab was very excited. Never failed to find on long retrieves with second assistant. "My pup loves it over the other dummies." My pup loves it over the other dummies. "My pup loves this bumper." My pup loves this bumper. I have to make sure not to leave it out as he will run off and pull the feathers out. He gets very excited when he sees me grab it. I'm sure I'll be getting a couple more soon. "This is an extremely good product." This is an extremely good product. My dog has now got the hang of search and flush. Looks great. Waiting for better weather to try it out. "I will be purchasing more." I have American Cocker spaniels. I love the this product, and my dogs are very excited to retrieve it. A great tool for dogs to learn to carry a feathered bird properly and promptly. The texture and feel is more like the real thing compared to just a canvas dummy. Well worth having in my dogs training. I will be purchasing more. "As close to the real thing as you can get"
Good for the price. As close to the real thing as you can get. It will only take so much abuse, but that's to be expected. Great for training. Dog loves it. "My dog loves the dummy and responds wonderfully with it!" My dog loves the dummy and responds wonderfully with it! I'm sure he will be flushing birds in no time. "When I pull out the dummy she will only chase and retrieve." Dog goes nuts. Loves it! She is 4 months old and will run when off her leash. When I pull out the dummy she will only chase and retrieve. She will always come back proudly! So far so good. Trying to keep my GSP from chewing it to pieces. Nice weight. It is holding up, but be prepared to slap some extra zip ties on it. Not sure how long it's going to last but hopefully it holds up. "The feathers do fall apart after a few uses, but if you are using this for hunting training as I am, you will have wings available to you for future use." Nova Scotia Duck Tolling Retriever. Hunts. Family pet. The feathers do fall apart after a few uses, but if you are using this for hunting training as I am, you will have wings available to you for future use. American Brittany. Hunts. Family pet. A realistic full feathered dummy for your pointer, retriever or flushing dog. 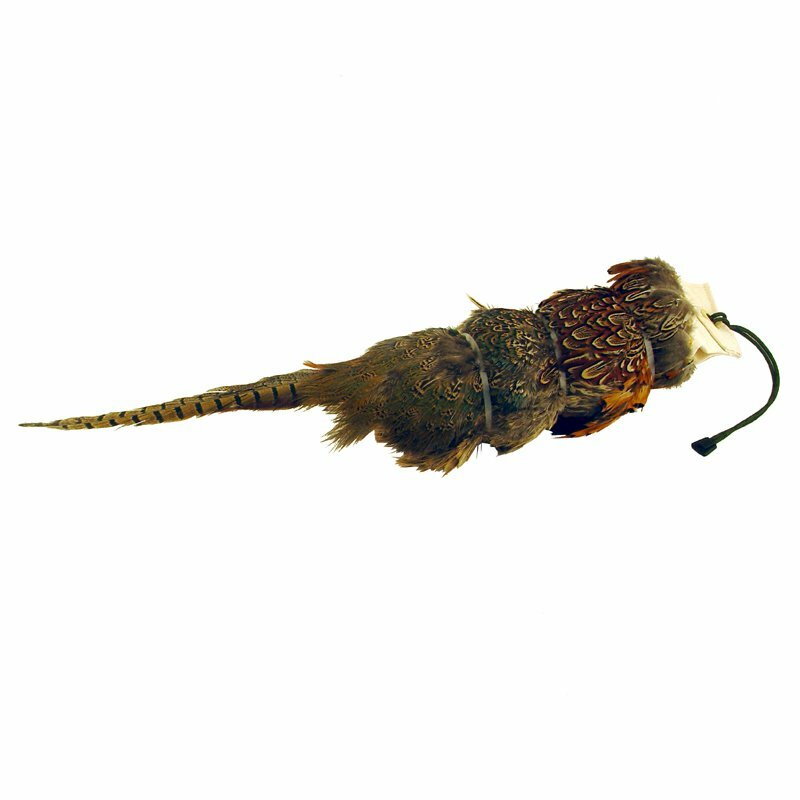 A realistic full feathered dummy for your pointer, retriever or flushing dog. A medium sized canvas dummy covered with a freeze dried pheasant pelt attached.